This is an ad card from the maker after the ad expired a year. The sender is one of postcrosser I met in the postcrossing meeting, Taipei. She was the member of NTU Modern Dance Club. I went to an union showcase of all dance clubs in NTU, but I have never been to any individual one. This cotton candy girl is a symbol to me that dancers are flying on the stage like the cotton blown by the wind. So light and so freely. Sending postcard can be a kind of propaganda. No matter what picture you choose, you express something. 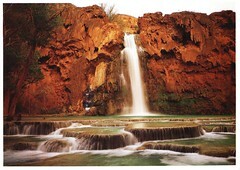 Usually, I prefer neutral postcard, like landscape, nature scene. 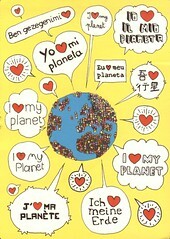 But this postcard shows me the love of our planet. I love the theme. 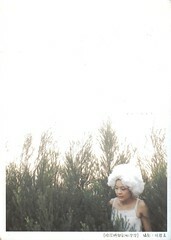 It is from a Taiwanese friend whom I left a message to on her blog about postcrossing. What a good choice for people from the same country! Thank you Nice. Plunge waterfalls are usually like a silk belt falling high on the riverbed. The white water usually attracts most of the sights. However, not only the water but also the yellow rock background and the travertine terrace make up this whole beautiful picture. The amazing power of water cuts off the hard rock and deposits the flat terrace. 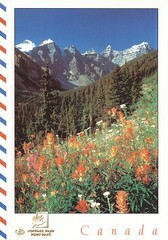 Banff is the first national park in Canada. I know Banff from the premier of Beyond the Arctic. Canada is not a mountainous country, but Rocky mountains are spectacular enough. The park is about an hour and half driving distance from Calgary. In the big country, people have different feelings of distance. One hour driving is far for Taiwanese, but not for Canadian. It seems they drive to the park quite often. The Banff Mountain Film Festival also shows their love of mountain. Although not a lot of people live around the mountain, mountain is still a good represent image of this country. And I believe that Canadians agree that. This is a postcard of a Christian Saint, Anthony of Padua. He is one of the most beloved saint because he is especially invoked for the recovery of lost things. 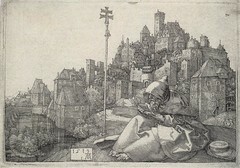 One of his symbols is book, therefore, he is reading in the postcard. People usually come up with writing when make mention of reading. No matter reading or writing, the reader or the writer look so powerful and beautiful in their own world with great concentration. 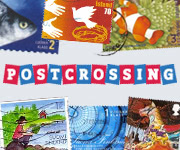 To write or to get a postcard is not like reading or writing books. But during the short period of a few hundred words, we also become powerful and beautiful. 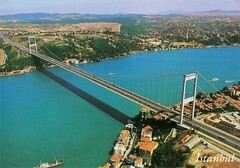 This Fatih Sultan Mehmet Bridge and Bosphorus postcard traveled almost 40 days. The bridge is 1,510 m long. Istanbul is 8,423 Kms from Taipei. Although this postcard was from the same continent, it connected two people at the two ends as the bridge connected two continents. This postcard was purchased during my Alishan trip in mid January. 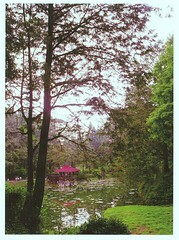 It was Lake Sisters which was a famouse place of Taiwan in China. I sent to a Chinese in March and emailed him to check whether it arrived or not in April. Unfortunately, it was missing by report on 2 May. The lake was in the deep forest and always in the mist. Now the postcard of the misty lake would never have been known where it is.